Join us for this 2-hour walking tour of New Orleans Historic Garden District. On this tour we will explore the lavish Antebellum section of New Orleans that was the original city of Lafayette, our first American city. Stroll through this elegant neighborhood that was built in the 1800s to rival the beauty and splendor of the French Quarter. We start this tour at the gates of the Lafayette Cemetery where many movies are filmed. 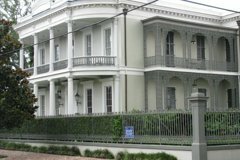 You will see the homes of the rich and famous, including the former homes of Anne Rice and Nicholas Cage. We will also see the home were Jefferson died along with other treasures on this 2 hour long walking tour.